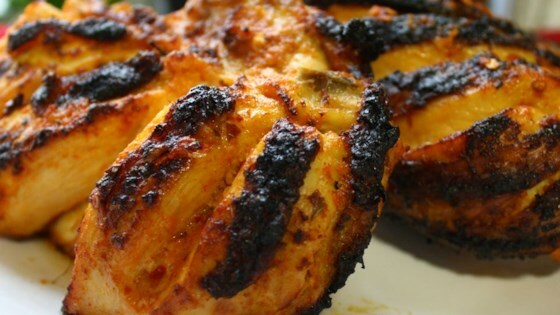 "This is a great spicy marinade recipe, a traditional African dish, great for BBQ. Nice with salad and fries, but I like adding it to a pita with salad and garlic Greek yogurt (3/4 cup Greek yogurt and 3 cloves of crushed garlic with finely chopped chives). Don't go on a date though, gives you wicked garlic breath!" Grilled chicken breasts get fancied up with a homemade blueberry gastrique! Delicious dish, I did not discard the marinade but rather baked the chicken in the oven with the marinade (emptied half. It was delicious and crispy. I've played around w/ this recipe a couple times now--using less paprika,added black pepper, added honey, etc. It has potential but needs something and the paprika is just too overpowering. This is the recipe I have been looking for, rather garlicy but it taste very yummy.I add a few drops of tabasco on the mixture for more tangy taste. Thank you.